Our WALKAroo™ 6430 with non-tilting work surface has a pneumatic lift for height adjustability. Includes our Ergo work surface in three wood grain options, Cord Access Portal, A/C adapter bracket and drawer. 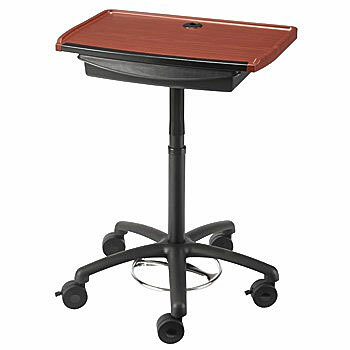 Five extra large 4" heavy duty casters on 24" diameter base keep unit stable and balanced. Two locking and three non-locking.